Question of the Day: What's on Your Dekotora? Never let it be said that Jalopnik does not love the dekotora. 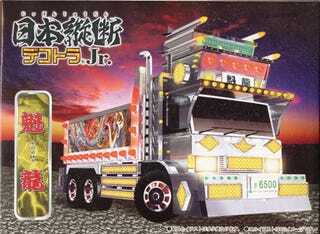 Combining big-truck badassness with Mobile Suit space-ageosity and pachinko-parlor chintz, the decorated trucks are simply some of the most outrageous custom vehicles ever made. We, naturally, would start with a Mitsubishi Fuso Super Great in cement-mixer form, featuring a carbon-fiber, high-RPM drum embedded with LEDs that — when spooled up to around 2,000 RPM — would display an image of Cliff Burton at 3:50 in this video, which is surely one of the most purely rocking moments ever acted out by any rocker, ever. We would then prowl the streets of Hayward, California at night blaring The Misfits' Walk Among Us at exceptionally high volume. We would also mount a neon-impregnated Lucite replica of a Rickenbacker 4001 bass on the grille. And that's only the beginning. But enough about us. How would you build a dekotora?